1950 | Out of the Box! GROW THE GROWL! BEARKAT FOOTBALL IS BACK! It’s time for the 101st season of BearKat Football! Come this Saturday the BearKats will be back on Bowers Field to meet the Oklahoma Panhandle State Aggies. This game will be the annual BearKat, “Orange Out,” so the stadium will be covered in a sea of orange, white, and blue. The image above is from a recent donation to the University Archives. 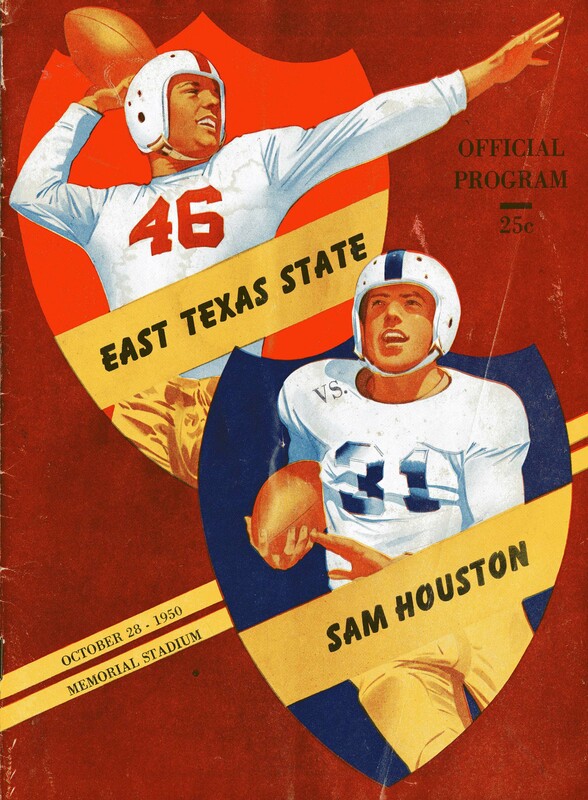 This football program is from the October 28, 1950 game featuring Sam Houston State Teachers College BearKats vs. East Texas State Teachers College Lions. The Sam Houston State University Archives collection of BearKats Football programs dates from the 1930s to the present. It you would like to look at these programs come visit the SHSU University Archives in Room 400 of the Newton Gresham Library. This Sam Houston State Teachers College BearKats football program from 1950 is a colorful example of the artwork that went into the football programs in the 1930s-1960s. All the colorful animal cartoon figures represent the team mascots of football teams that Sam Houston State had played up to that point. This cover was done by Ed Dillion. 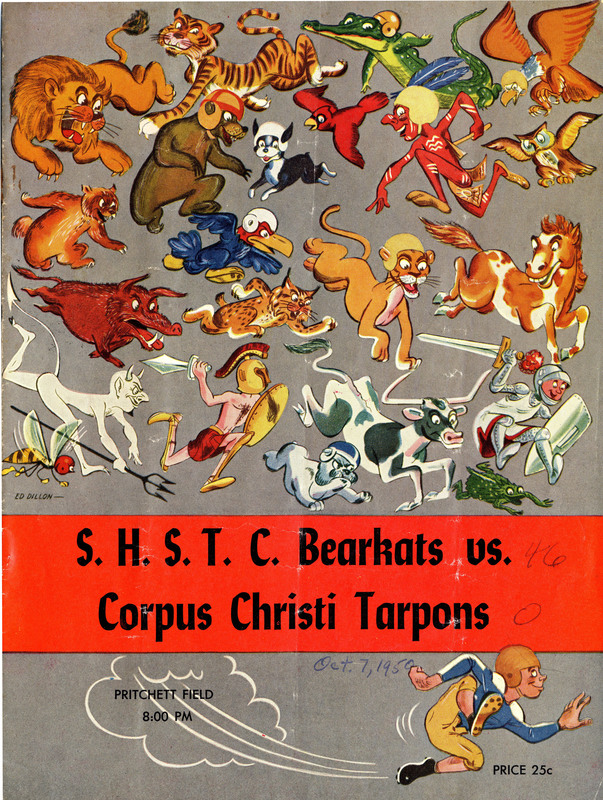 In this 1950 game, Sam Houston State Teachers College BearKats played the University of Corpus Christi Tarpons. The game was a blow out with the BearKats winning 46-0. The BearKats have a 6-0 and 201-32 points scored record against the Tarpons from 1950-1965. Two school records were also set in these games. The first in 1954 for the 11th longest pass of 81 yards for a touchdown thrown by quarterback Allen Boren to Bobby Baldwin. The second record was the 9th longest punt return of 70 yards for a touchdown set by Tommy Luker in 1964. The University of Corpus Christi Tarpons started playing football in 1947 with the mascot of a tarpon. In 1966 the University of Corpus Christi football program was ended. In 1994 Corpus Christi State University was incorporated in the Texas A&M system and the student body then voted to become the Islanders but their mascot was known as Tarpy the Tarpon until 2004. Special thanks to the Mary and Jeff Bell Library, Special Collections Department, at Texas A&M University-Corpus Christi for the history of their football program and Tarpy the Tarpon. To see this program and many other BearKat football programs from the past 100 years come visit the SHSU University Archives, room 400 of the Newton Gresham Library. It was 55 years ago that the Sam Houston State Teachers College BearKats beat Lamar at home in a 45-0 blowout. With this non-conference game the Kats won 4 games in a row. A feat the previous year’s teams failed to do. The Kats would go on to win 5 and lose 5 and end up 3rd in the Lone Star Division. Clipping from the sports page of The Houstonian, October 18, 1950. Special thanks to the Sam Houston State University Athletics Football records book for providing University Archives with all the football stats the archives could ever need. Click this link for the SHSU Football records book pdf.